Joan Breakey is one of the few dietitians in the world who has a lifetime of specialisation in the area of Food Sensitivity. She is a Dietitian, Home Economist and Teacher . In 1975 she began her first work on Diet and Hyperactivity, investigating the effects of the Feingold diet on children’s behaviour. For the last thirty years Joan has been writing articles, publishing and presenting the results of her on-going research in this area. She has worked as the Adviser in Nutrition and Dietetics to the Department of Health in Queensland (Australia) and as a Dietitian in Community Child Mental Health where she was the only dietitian employed to help families see how diet could help while they received all other necessary care. Joan continued her research, conducting clinical research with families using dietary treatment for behaviour, learning and activity problems. In 1991 she published the results of a follow-up study of over five hundred families, over one hundred in detail for her masters degree and another five hundred before writing Are You Food Sensitive? Her work was published as an invited chapter in the international book Food Additives in 2000. As well she has worked with hundreds of families in private practice investigating the role of diet not just in behaviour, ADHD, and ASD, but also in treatment of physical, allergic and food intolerance symptoms such as eczema, asthma, hay-fever, migraine and IBS. Food sensitive people are often those who are very sensitive to smells, strong tastes, bright lights, particular noises, and textured clothes. Through her work with hundreds of food sensitive people Joan can give a picture of what happens in food sensitivity. 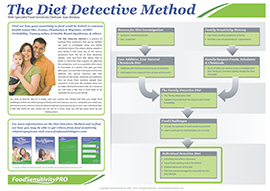 See how using the Diet Detective Investigation method can show how diet can help you. In 1995 she received a Master of Applied Science degree for her research in this field. The Thesis showing the evidence base is available as also available in eBook format for reference.